Tooth enamel protects teeth by providing a hard surface resistant to wear and tear, withstanding impacts without breaking over the lifetime of an organism. 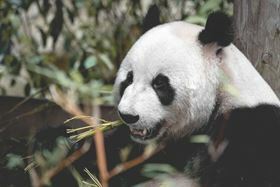 The Giant Panda has particularly clever tooth enamel, according to researchers, which can recover its structure and geometry to counteract the early stages of damage [Liu et al., Acta Biomaterialia (2018), https://doi.org/10/1016/j.actbio.2018.09.053]. The team from the Institute of Metal Research, Chinese Academy of Science, the University of Science and Technology of China, Lanzhou University of Technology, and the University of California Berkeley believe their observations could be replicated in the tooth enamel of all vertebrates, including humans, and inspire the design of artificial durable ceramics.